A couple of months ago we decided on replacing part of our backyard grass for concrete. That might have sound a little bit too strong coming from a person like myself who loves almost all things green and nature. But because this was just 1/3 or our patio, we ended up making the most out of this area. And now we have two beautiful sitting places where our family can get together and share memorable moments. But what about furniture? 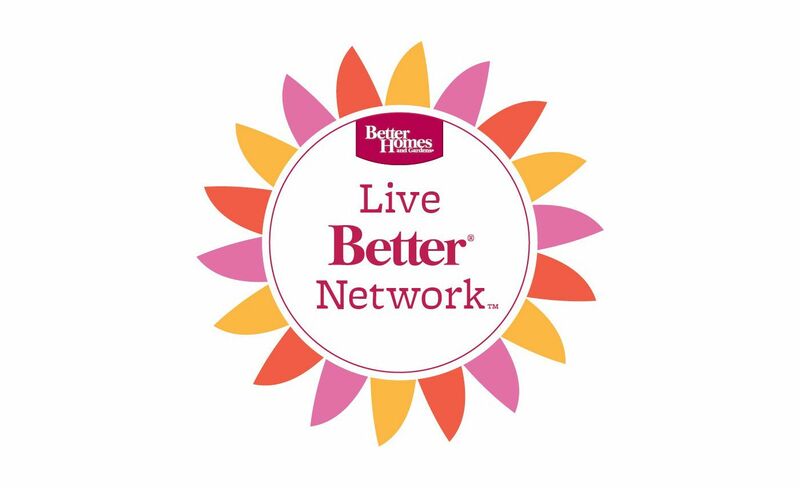 Well, for this small area I found a +BHG Live Better Carter Hills Outdoor Conversation Set at +Walmart that was just the right fit and that had me at “Hello”. 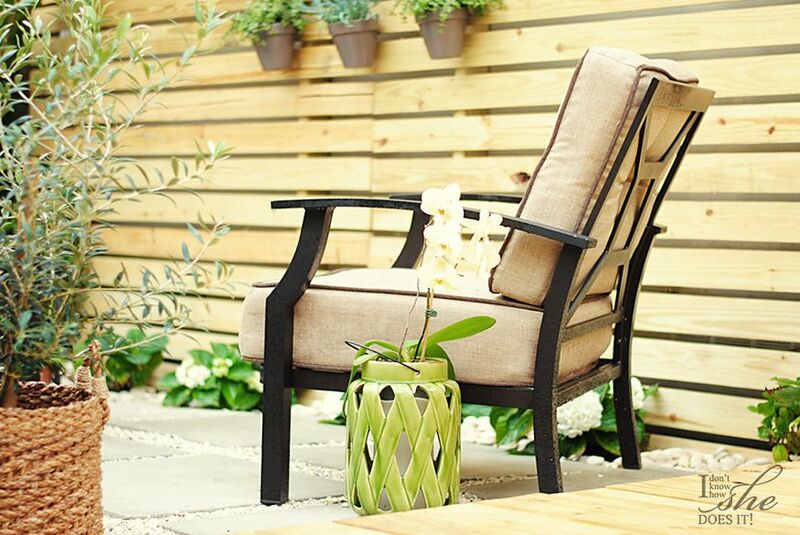 The set comes with enough space to sit 5 persons and the tan color that I chose is perfect to pair down with different colors of outdoor toss pillows. This Carter Hills set came with a slat-topped coffee table. 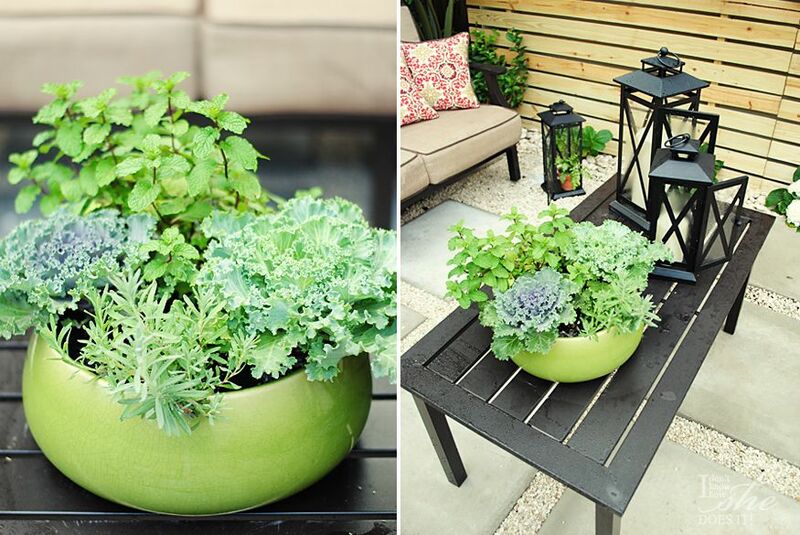 To styled it, I placed a ceramic bowl (also from BHG Live Better at Walmart) and used it as a mini-edible garden with some fragrant herbs like mint and lavender. For that extra bit of color, I added to this arrangement two different types of decorative kale. 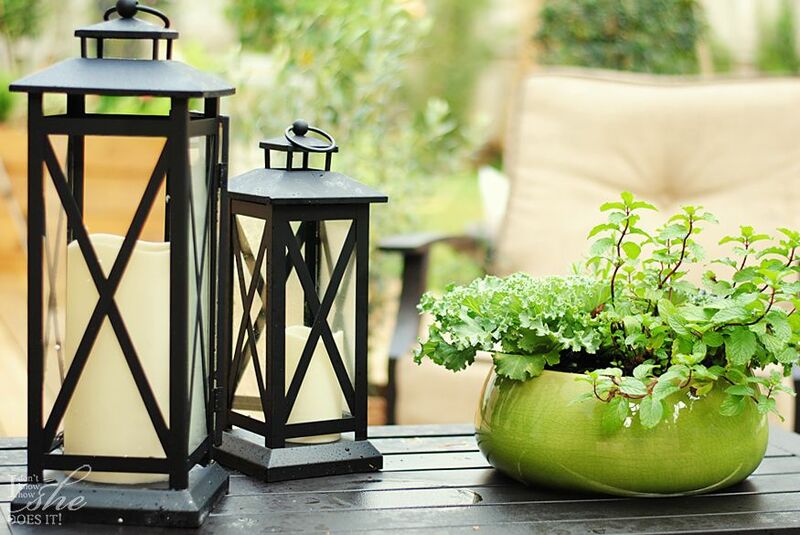 It’s incredible how simple plants can create an interesting table centerpiece and bring life to its decor. 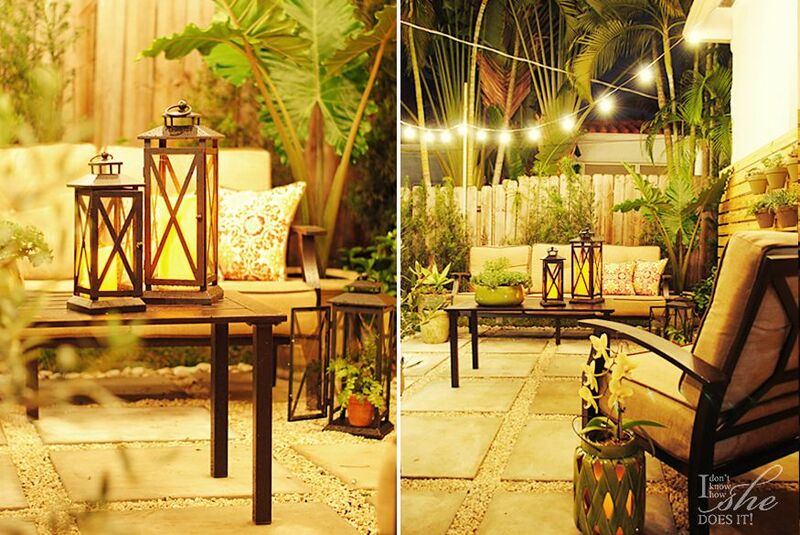 In combination with the ceramic bowl, I used a Crossbar Metal Outdoor Lanterns. 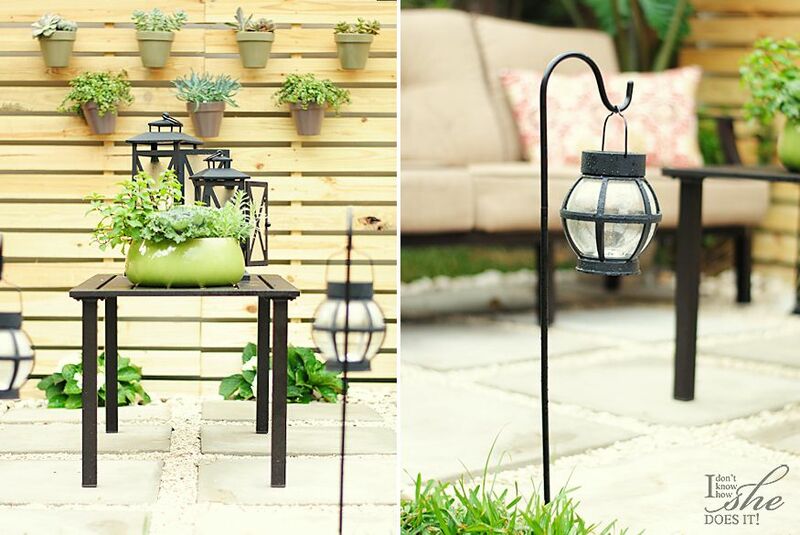 Nowadays these can be found in different materials and sizes and serve as decorative elements as well as illuminating accents when the night falls. 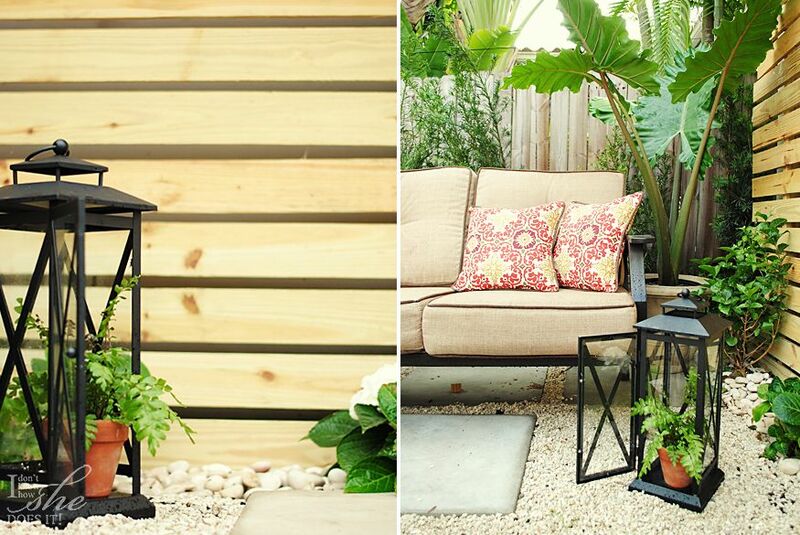 If you love the look that these Crossbar Metal Outdoor Lanterns bring into our exterior, remember you can buy them online here as part of the new garden collection of BHG Live Better at Walmart. These come in three different sizes, so you can better mix-and-match them (since I couldn’t resist, I ended up picking all three). I also added a 12″ Ribbon Ceramic Lantern to add ambiance during the night with a LED candle, or character with a plant during the day. As you can see green is my favorite color! I placed it on the side of one of the chairs to enhance this little corner. 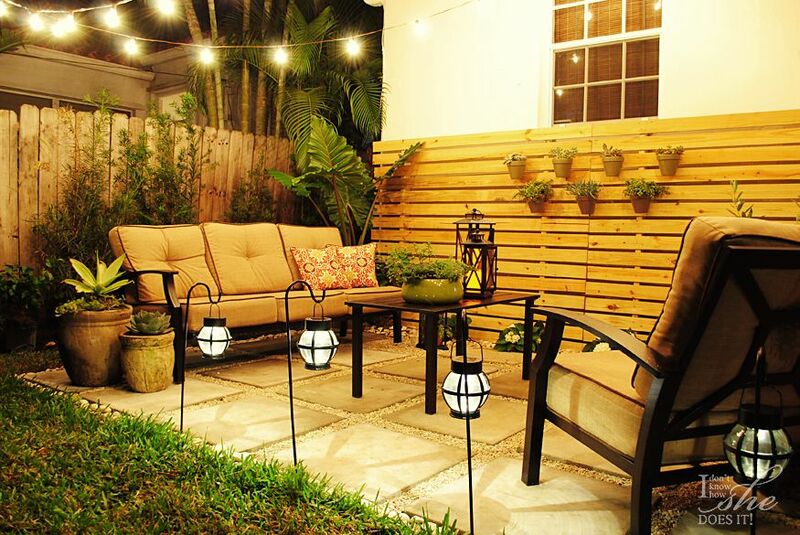 Now, to finished this entire area we hanged the Edison Glass string lights to bring a vintage vibe into this decor and set some Beaumont Solar Powered Landscape Lights to frame this little gathering nook. 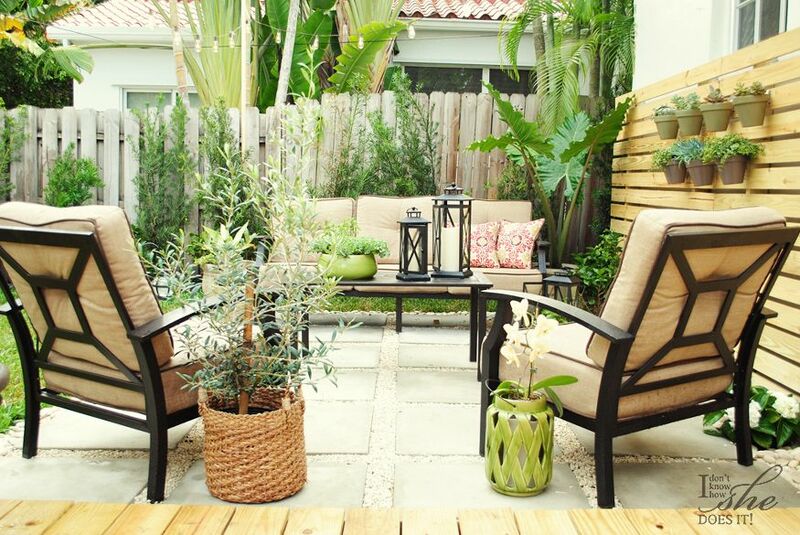 Some palms and other potted plants helped on giving this outdoor area it’s own organic identity. This area is now ready for my guests and a couple wine glasses! 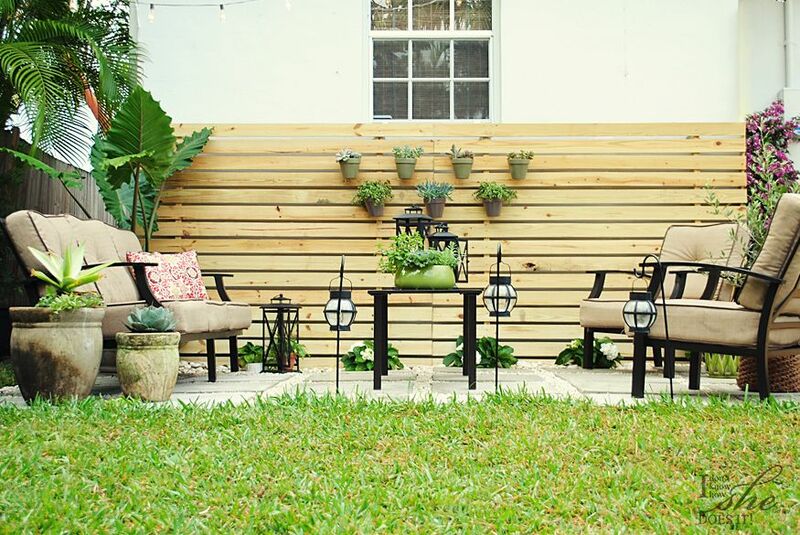 When styling your outdoor space keep in mind three things: a coffee table to set beverages and/or appetizers, lighting for the evening gatherings and a comfortable and beautiful sitting set like the Carter Hills from +BHG Live Better at Walmart. 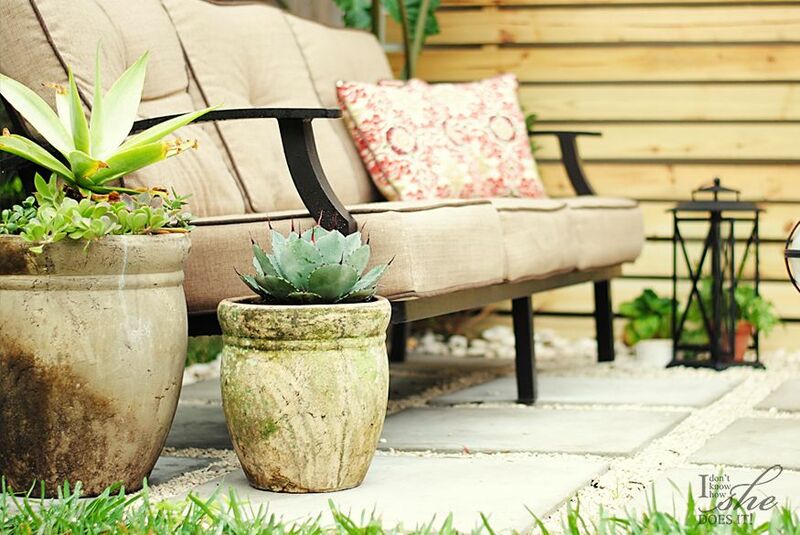 What other accessories are a must in your patio sitting area? Looks great! It especially glows at night. Your space is ready for a party! Beautiful space, I love all the green! Thank you! 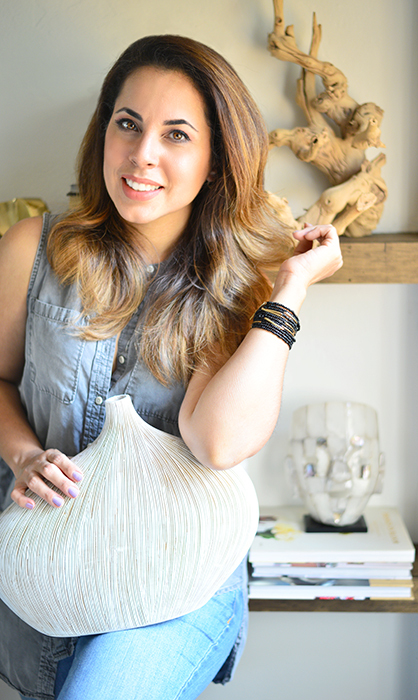 I love green too because it makes everything feel so fresh. Thank you Shannon! 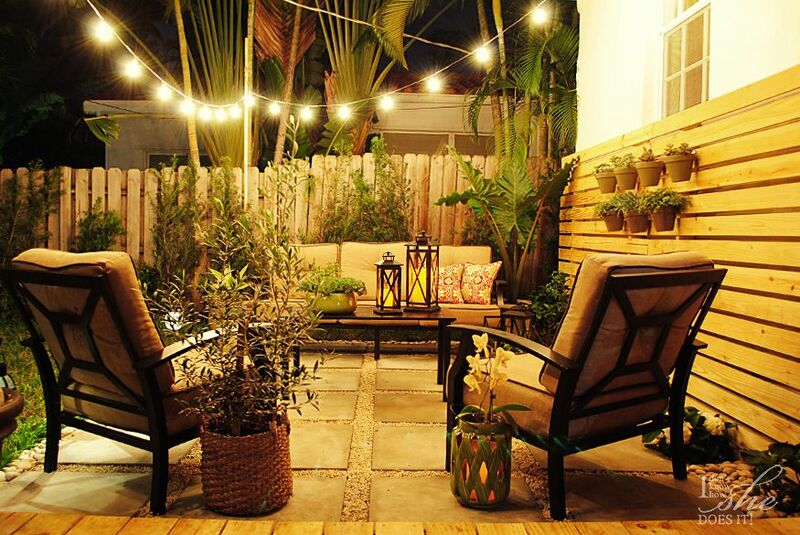 The string lights at night really make all the difference.